Dogs and heartworms - Commercials I Hate! I have a question about dogs and heartworms. When I adopted my dog, Solo a few years ago a lot of people here were helpful in tips and stuff, so I thought I'd ask you guys. First, Solo is fine. He's 3 and a half now, and he's perfectly happy. Hell, my neighbor called him the "happiest dog in town". But now we have another dog. I'll explain. A lady around the corner is a board member of the local No-Kill shelter. She always tells me that Solo could use a “buddy” dog. So does my wife. Recently we adopted a female pitbull from the shelter. She’s also three years old and has a sad story. Her original owner kept her penned up and was illegally breeding pitbull puppies. She’s had several litters, basically as much as she could every heat cycle. She was taken by Animal Control with her pups. The No-Kill shelter took her in so she would not be euthanized after her pups were weaned. (they took the pups, too…and all of them have been adopted.) She was living at the N0-Kill shelter since March. But now she lives here. It’s only been a day, but she’s really fitting in with Solo. She doesn’t like to share toys, but otherwise “Layla” is fine. But she has heartworms so she needs to go for treatment tomorrow. She’ll be at the animal hospital overnight and can come back home on Friday. After that they told me that she has to take it easy and not exert herself too much for a few weeks. I just need advice on how to manage that. She loves going for walks with Solo by her side. In the yard (we have a decent sized fenced in backyard) she seemed content to explore it and just chill in the grass. But she also plays “Chase me” with Solo. 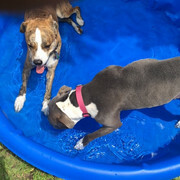 (Admittedly he is more into it than she is, but Solo is easily excited and loves to run)I can’t keep her inside all summer, but I don’t want her to overdo anything (for her own health while she’s being de-heartwormed). If anyone here has experience with something like this I’d appreciate any advice. I'll post pics once I figure out how to do that again. Congratulations on your new pup! Solo and Layla sound great together. Perhaps when Layla needs to go outside you can walk her around on her leash, even if it's in the backyard, if she gets too active. Does Layla like snuggling and cuddling? If so, increase your time with her doing this and also include Solo so he doesn't feel left out. The best thing to do is ask the vet or vet tech what exactly constitutes too much exercise and see if they have any advice. Good luck! Love your story! Can't offer much in the way of advice, though. But I once had to keep my cat Mal from scratching at stitches he'd gotten at the vet, so it was suggested I "sedate" him for a day on a tiny dose of Benadryl. It worked. I dunno if you could do that for any extended length of time, though. I take Solo outside with her every time so he doesn't feel like he's being ignored. Watching them today I don't think it will be a problem keeping her from too much exertion. She's active like a normal dog, but she prefers to lay in the grass and chew a toy. If you THROW something she will run to get it, but I can try to leave her inside when Solo needs a little fetch time. Here's the issue. I gave her a new squeaky ball today. She squeaked it constantly for TWO HOURS. My wife works at night. I work from home. She couldn't sleep and it was driving me insane. Hell, I think even Solo was like "GIVE IT A REST!". I took it from her and man, she cried and wined as if her heart was broken. (So I gave it back to her in the backyard. When we went inside I gave her another non-squeaky toy) I think the issue is that she obviously never had a family or a decent home and things that were hers. So now she jealously holds onto things. Probably everything she's ever had, including her pups, have been taken away. So I need to work on it, try to let her know she's got a home and toys and we'll take care of her. Which makes tomorrow sad. She has to stay overnight at the animal hospital for her heartworm treatment. I don't want her to think she's being given away. Don't worry too much. Layla's going to be just fine now that she's got her permanent home. She already seems to be having it better now than she ever did in her life. I've heard that dogs rescued from such situations will always appreciate their rescuer, and be fully devoted. I keep getting error messages when I try to post pictures. I must be missing something. I use postimage, it's really pretty easy. Load the picture from your computer and they will give you several options on how to post a picture. There was recently a problem with Postimage. They changed some kind of formatting and all the old pics that were posted with them disappeared. Even the links to them no longer work. I've had to repost several old pics to get a new link. It's hard to tell from the pictures but Solo is a little bigger than she is. Of course, he's only half pitbull, so her mouth is freakin' HUGE compared to him. She looks like the Buster Brown Dog when she dog-smiles. She's also really kinda musclebound. If not for her saggy teats (because of the non-stop breeding she was forced to do) she'd be really fearsome looking. But she is really gentle in person. Layla and Solo are so adorable! They look like they're living the good life and are happy as can be. I've never had a pitbull before, or even been around many of them. But some of my friends act like I've adopted a t-rex. Do pitbulls still have this rep for being ultra violent dogs? Because Layla is completely sweet and friendly. But people act like she's just waiting to eat someone. There was another Pitbull attack on The People's Court this morning. We had a German Shepherd that was pretty aggressive, she never bit any people or pets. She was attacked by a Husky at a dog park, just one puncture on her neck. She was fine. She got loose a few times accidentally. We would ALWAYS keep her on a leash.